Prior to their Christmas number one in 1980, the children from the St Winifred’s School in Stockport, Greater Manchester, had appeared on another chart-topper, backing Brian and Michael on Matchstalk Men And Matchstalk Cats And Dogs in 1978. Having had a taste of success, the headmistress, Sister Aquinas gave her consent for the children to record another song. The choir mistress, Miss Foley, rounded up the best boys and girls and set to work. The song was recorded at 10cc’s Stockport’s Strawberry Studios and featured Rick Wakeman on keyboards. All the royalties went to the St Winifred’s school fund. Miss Foley picked eight-year old, Dawn Ralph to be the lead singer, which was an interesting choice because most of Dawn’s front teeth were missing which gave her a lisp. The group travelled to London to appear on Top Of The Pops. There, they met Abba, who invited them to support them on their UK tour. The song entered at number 47 and surged up the chart. Tragedy struck the week it reached number two when the world learned of the murder of John Lennon. At the time, the young performers were more concerned about not having a number one than the ex-Beatle’s untimely death. It didn’t look like they were going to get it. A week later, John’s ‘(Just Like) Starting Over’, which was already on the way down the chart, rebounded 21-1 leaving the kids in second place. John Lennon’s comeback album, Double Fantasy, was selling well so less people bought the single. The following week was Christmas and it went to number one after children up and down the country bought a copy for their grandma. They stayed there for a fortnight. After that, the kids grew up and never troubled the chart again. Thinking he had hit a commercial motherlode, Lorenz wrote My Mum Is One In A Million for Mother’s Day, 1981, and it was a Top 30 single for the Children of Tansley School. And, in 2002, Lorenz got his wish to write for royalty. He wrote “Rejoice, Rejoice” for the Queen’s Golden Jubilee. It was sung by a 1,000-strong choir conducted by Sir David Willcocks and performed as the Queen left Buckingham Palace for a service at St Paul’s Cathedral. In 1998 he worked on Voice Of An Angel, for a 12-year-old Charlotte Church, which became a Top 10 album. Lorenz died in July 2011. When Brian and Michael first heard that the choir were going to release the single, they offered to write the B-side which was called Pinocchio. In 2008 the song was used in a one-off Channel 4 comedy by Peter Kay called Britain’s Got the Pop Factor…, which had original member Sally Lindsay (who was also in Coronation street), made a cameo appearance. 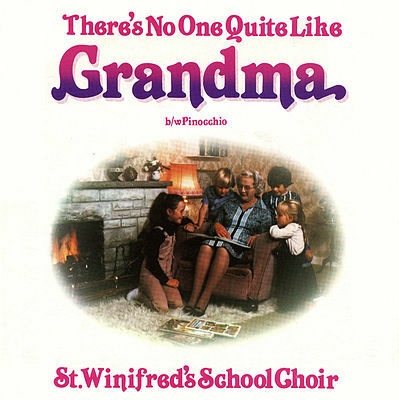 The following year the song was re-recorded by 14 members of the original choir and was released as a promotional campaign for the food company Innocent Drinks’ ‘Big Knit’ campaign, to raise money for Age Concern.